LONDON (Reuters) - Prime Minister Theresa May is trying to clinch a Brexit divorce deal with the European Union but the bigger challenge may be to get any agreement approved by the British parliament. With less than five months until the United Kingdom is due to leave the EU on March 29, how might the Brexit finale play out? Any deal must be approved by British lawmakers. If they reject it, Britain would face leaving the EU without an agreement. Sterling, which has fallen to $1.28 from $1.50 on the day of the referendum, would sink while bond yields on UK debt would likely fall. May's compromise plan, which seeks to maintain close trade ties with the EU in the future, is facing opposition from Brexiteers, pro-Europeans, the Northern Irish party that props up her government, and even some of her own ministers. With no deal and thus no transition period, the UK would move - on March 29 at 11 pm London time - from seamless trade with the EU to customs arrangements set by the World Trade Organization for external states. Business chiefs and investors say a "no-deal" Brexit would weaken the West, panic financial markets and block the arteries of trade. Brexit supporters say such fears are exaggerated and Britain would thrive in the long term. U.S. investment bank J.P. Morgan said on Nov. 9 it expects parliament to reject the deal at first and then, after a period of volatility, to give its approval on a second or even third go in early January. The opposition Labour Party has indicated it will vote against the deal and that if the government loses then it will demand a national election. 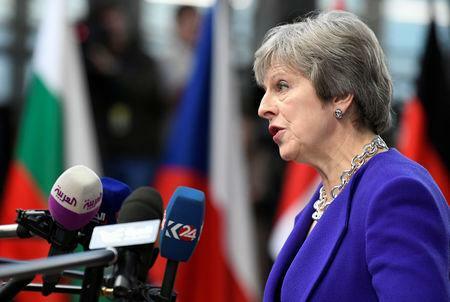 It is unclear whether May would hold on to power after losing a parliamentary vote on her Brexit deal. May's snap election in 2017 lost her Conservative Party its parliamentary majority and the government is now propped up by 10 Democratic Unionist Party lawmakers from Northern Ireland. Her party, which has been split over Europe for 30 years, is in open conflict and some of her lawmakers want a new leader. It is unclear who might replace her. If May fell, selection of a new party leader could delay already tight Brexit negotiations. A national election is possible, though not legally necessary. Opinion polls show no party has a clear enough lead to be sure of victory. EU diplomats say a deal is almost done, though they are haggling over intricacies of a backup plan for the land border between British-ruled Northern Ireland and EU member Ireland. "Technically speaking, the text is ready. But there is no political agreement from their side," a senior EU diplomat said. EU sources said they want clarity from London by the end of Wednesday at the latest if there is to be a summit this month to approve a Brexit deal. If there is no summit to approve Brexit this month, then the EU has a scheduled council meeting planned for Dec. 13-14, though an emergency summit could be also be called. The British parliament goes on holiday on Dec. 20. "Our base case is firmly for a deal," Goldman Sachs said in a note to clients on Nov. 9. "We assess the probability of a deal to trigger the status quo transition period as at least 70 percent." If the UK slides into chaos, there is a chance Brexit could be stopped through a popular vote, though May has repeatedly ruled out another Brexit referendum. Polls show Britons remain divided, though a recent survey by Survation showed the United Kingdom would now vote to stay in the EU as more young people and those who did not bother to vote in the referendum would now vote against Brexit. Jo Johnson, the younger brother of leading Brexiteer and former foreign minister Boris, resigned from May's government last Friday, calling in a withering critique for another referendum to prevent her Brexit plans. The main hope of campaigners for another referendum is that May's deal is voted down but Labour's wish for an election is thwarted. Parliament, according to this scenario, would vote for a second referendum and the Article 50 process would be extended to allow a referendum to take place. Brexit supporters say a second referendum would trigger a major constitutional crisis, and possibly even public disorder.